A little treat today folks as I had a chance to talk with Michael Blair from Aspyr Media on a few different bits relating to Linux gaming and their Civilization V port. Can you introduce yourself and tell us what you do at Aspyr? My name is Michael Blair and I am the “Sales Manager” at Aspyr. I manage our sales relationships across the globe, but I am also the main point of contact with the Press and the gamer community. My job is to ensure we are making consumer focused publishing decisions. Simply put, Aspyr feels the best way to have a successful sales channel is to make sure we are reaching out (and advocating for) the folks that support that channel. 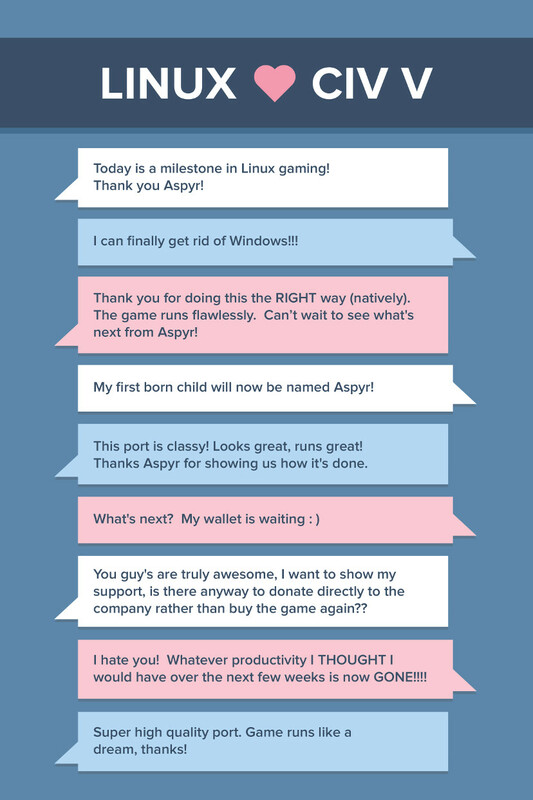 Why did Aspyr decide to push into the Linux market? We have over 17 years of experience in OpenGL development on the Mac, so when Valve decided to enter the market with SteamOS we knew we would be well positioned to service a small but growing community with our expertise and strong publishing partnerships. How have you found the reception from Linux users so far? It’s unbelievable! We were honestly floored at the positive support from the community. We had a team of 5 covering the forums and community blogs during the release of Civilization V Linux, and we had a very hard time keeping up. We even made a poster for our office with some of the nice reactions from the community. It puts a smile on our face every day. Are one of those comments yours? Let us know! Since this is your first movement into Linux what roadblocks did you come up against with Civilization V? With any project of this size there are hundreds and hundreds of bugs, but honestly the process went fairly smoothly. This is mostly thanks to the Mac OpenGL code base that we worked from. Our Mac team did an INCREDIBLE job with that original port which allowed the Linux team to focus on Linux and SteamOS specific coding. What tools did you use to port Civ V to Linux? Most of what we use is our proprietary tools and library that we have built and refined over 17 years, but there are always small things that help like SDL2, Bink, Miles, and of course a solid compiler and editor. What do you think to Valve's SteamOS and Steam Machines for the future of PC gaming? We feel it’s a huge step in the right direction, and will only add to the PC gaming market, not detract from it. We have had our hands on SteamOS, Steam Machines and the Steam Controller for some time now, and we are absolutely believers. Its a really great experience as-is, and its only going to get better. We certainly knew we would have a fair amount of “backfill” when releasing Civilization V Linux. What we were surprised to find is a community of Linux gamers that actively sought out a way to compensate us for our efforts. Many took advantage of the sale on launch day and purchased DLC that they didn’t own, while some bought the Complete version to make sure they had all the content. I think because of that viral community support, sales were better than expected! We developed everything on Ubuntu 14.04 and then used both SteamOS and Ubuntu for our testing environments. For you as developers what do you feel Linux is lacking right now (apart from the obvious market share) for more ports to happen? Any time there is a new market opportunity, developers have to evaluate the investment vs. potential payoff. The Linux market is a very small part of the current marketplace making it a risky investment. Because of that risk the tools to develop on Linux aren’t as developed as other platforms, so it’s a small market with a challenging development environment. Because we’ve spent our entire careers servicing the Mac and OpenGL code base it’s been an easier transition for Aspyr. Taking big brands to less developed platforms is our core business model, so we’ve been able to react quickly. Wider adoption of Linux, and the Linux audience getting behind the content (as they have with Civ V) will be an integral piece in getting more content to the platform. Valve’s support of Linux and the adoption of Steam Machines is a giant piece of that happening. You said that the port was developed directly on Ubuntu, so what's your favorite distribution and desktop? SteamOS because we are excited for the possibilities of a more mainstream Linux distribution, but Ubuntu 14.04 is really quite solid. Did Valve get involved much to help? Most of our collaboration with Valve centers on the controller and making that experience the best it can be, but they’ve also been available and eager to help in any way they can. How were the sales on Linux in comparison to the Mac sales when originally ported to Mac? Are they comparable or still some ways off? Right now Steam stats show Mac at around 3.6% of the user base, and Linux at 1.2%. That’s pretty close to the sales reality although for this release, its lower on Linux due to the title being out for some time and the large amounts of users that already own it on the other 2 platforms. With sales being better than expected has that secured more ports to Linux from your catalogue of Mac ports? Yes! We have active titles in development for Linux. We hope to see more games out in coming months, and we hope to have the opportunity for some simultaneous Mac and Linux releases in the future. How receptive were 2K the publisher when you approached them about a Linux port? Very. 2K is a great partner to Aspyr and Valve. We all have a lot of interest in seeing Linux and SteamOS be successful, and we’re all working together to learn what we can about this growing market. Have you come across any publishers not wanting Linux ports yet? Oh sure, but that’s something we are used to from years of helping partners believe in the benefits of expanding their user base to the Mac. Will your ports be Steam only releases, or do you plan to support fully DRM free stores like GOG in future too? Currently we only have plans to publish on Steam, but we are always open to expanding the sales channel through other opportunities. I would like to thank Michael for taking the time to chat. If you haven't already go grab Civilization V on Steam. I do love these interview pieces. very nice and professional interview. thank you! Aspyr Yes! We have active titles in development for Linux. We hope to see more games out in coming months, and we hope to have the opportunity for some simultaneous Mac and Linux releases in the future. Good to hear that multiple titles are in development! I knew they wanted to do more with Linux, but I think this is the first time I've seen that they've specifically used the plural to confirm multiple titles in development. I wonder what the games in development are. Bioshock would e great but not getting my hopes up. The poster is pretty cool, but makes me wonder if CD Projekt RED had a poster, what that would look like . Jokes aside though, the reaction Aspyr got probably dispelled any doubts they had about doing future ports, much like negative reactions might have put others off. Good to hear they've more ports to come. CivV is really an amazing game (I bought it on Linux, never played it before), and the implementation seems rock solid (have not yet seen bugs, crashes or similar). Can you ask them that they can share version for linux of star wars jedi academy and jedi outcast? After that when lukasarts open code of engine, community make port for linux. I think the license won't be problem. "Right now Steam stats show Mac at around 3.6% of the user base, and Linux at 1.2%. That’s pretty close to the sales reality although for this release, its lower on Linux due to the title being out for some time and the large amounts of users that already own it on the other 2 platforms. But when the game came out officially on Linux, I bought ALL the DLCs that I still did not own, just to show that yes, there is a demand for such good ports. It will be interesting to see the sales for new titles like Civ - Beyond Earth. Still keen to buy Pandora as well. I had no interest in strategy games before this came to Linux and would have never played it if it didn't. The first time I played it I started at like 2pm and suddenly it was 3am. I now refer to playing Civ V as going to my time machine to travel to the future. I wish you asked them about the Civ - Beyond Earth Linux port!! Age of Empire II and Age of Mythology for Linux would be a dream come true.